It was 8:50am in Azad Jammu Kashmir (AJK), the Pakistani-administered region of Kashmir, when the buildings collapsed. In a matter of moments, thousands were killed – a number that would skyrocket into the hundreds of thousands in the coming days and weeks as those needing medical attention failed to receive it. In a matter of moments, students watched 20,000 of their friends, classmates, and peers lose their lives, sending them toward a trauma that continues to impact them today. In a matter of moments, 3.5 million people were homeless and facing displacement, unprotected from the cold, northern-Pakistani winter, without the familiarity of their family homes to provide even a hint of solace and comfort as they processed the tragedy that had just struck. The year was 2005. It was April 26 when the Pakistani army commenced Operation Black Thunderstorm in northern Pakistan, targeting Taliban militant hideouts scattered across the region surrounding and including Swat Valley. Within 5 days, approximately 2.4 million Pakistanis from the region had registered as displaced. Within a matter of weeks, hundreds of thousands arrived at refugee camps in the region – broken, homeless, and without shelter. Even more concerning, hundreds of thousands more were unable to escape the warfare and were still trapped by the month-long campaign, making them vulnerable to Taliban guerrilla fighters looking to defend themselves with civilian shields. The year was 2009. Internal displacement is a concept familiar to Pakistan. In a country with one of the highest rates of refugees, the number of internally displaced persons (IDPs) has in many situations surpassed that of refugees from neighbouring countries like Afghanistan. Incidents like those above are just a few of the most impactful, having lent heavily to the increasing number of Pakistani IDPs. But what can be done to help? Zahid Johnson has spent years translating his passion for sport into an answer to that question. The great-grandson of Indian immigrants who crossed into Pakistan in 1947 soon after the Indian Partition, Zahid was born and raised in Abbottabad, less than 50 kilometres from the western border of AJK and a mere 140 kilometres southeast of Swat Valley. Given his close proximity to both regions as they underwent immense damage and conflict, it is no surprise that he was poised and ready to respond when catastrophe struck. 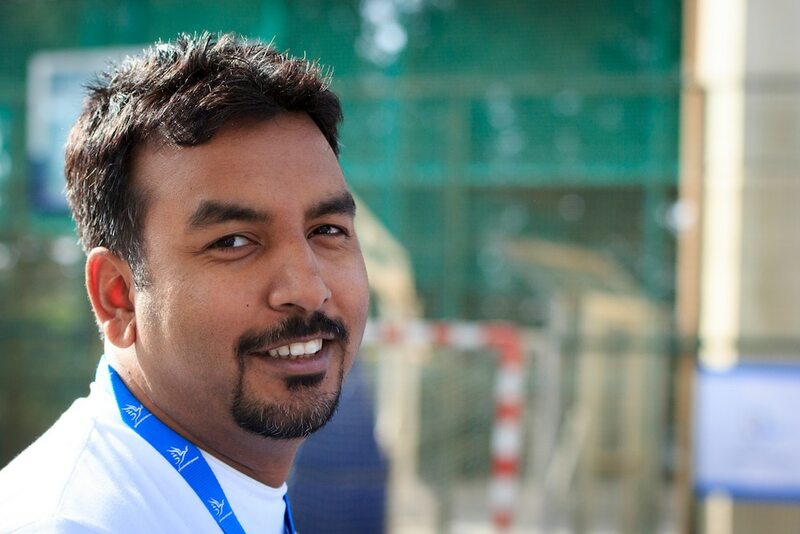 Like many, Zahid had not always seen sport as a driver of peacebuilding: for much of his life, he saw sports simply as fun activities to play with friends in his community and at school. Throughout primary and secondary school, and well into university, Zahid had committed himself to basketball – his favourite sport and one which would become a major aspect of his future and the future of children and youth, many of whom were displaced, across northern Pakistan. Zahid took this to heart. He began crafting the foundation of an organisation called the National Sports Coalition, which he hoped would one day grow to impact youth not just by training them and making them physically healthy, but also by bringing them up to contribute to and create a better society through their activities and the concepts they learned through them. He did not realise that three years after this idea was born, what he thought was a colossal distraction would actually help him build it out further. After the earthquake of 2005 hit northern Pakistan, Zahid turned his attention from sports to help rebuild the communities that had been destroyed. As they slowly began to rise from the dust and as students began to return to their schools, Zahid and the communities he was serving in began to recognise a challenge that had not foreseen: students returning to schools were undergoing serious trauma from having witnessed their friends and peers taken by the earthquake, in some cases only a few months earlier. Yet many of those responding were unequipped to address the trauma. So Zahid began organising sports activities, helping students overcome their trauma through athletics and friendly competition. Though he had taken time away from building his organisation to help contribute to the earthquake disaster relief and rebuilding, he had stumbled on to an opportunity to use his passion to shape the lives of the children and youth, who returned to their schools healthier and with more stability thanks to his efforts and growing expertise. Over the coming years, as Azad Jammu Kashmir continued to rebuild itself, Zahid continued to expand his work with sport for social impact. Though he was putting it to use in a variety of contexts, it was not long before he was inspired to use it to contribute to the effects of another widespread challenge that impacted many people undergoing traumatic experiences and losing their homes, ways of life, and all that was familiar to them. As Pakistan ramped up its military efforts against the Taliban in 2009, the millions of displaced Pakistanis fleeing to new regions and refugee camps began to be blamed for overcrowding, lack of resources, and even acts of terrorism. This conflict occurred the same year that Zahid first attended a Generations For Peace training camp, where he learned that he was not the only one passionate about using sport and other activities to build social cohesion and peace. Over the next two years, Zahid began to implement what he had learned from the training, building programmes and activities in camps like Jalozai, which were host to a range of foreign refugees and internally displaced persons, young boys and girls often set at odds with one another, and men and women of differing religions facing conflict with one another on a daily basis. Sport overcame many challenges and acted as a way of entering into and building the trust of communities within the camps, providing an outlet for people from different groups to engage with one another when they otherwise might not. “You can take a ball and take a bat and bring together two cricket teams, and they will forget about their differences. I think that’s the magic of sports,” Zahid shares, reflecting on the effects of the activities on those living in the camps. Today, Zahid continues to work with Generations For Peace to help build peace through sport for those remaining in Jalozai Camp and in the surrounding communities. In fact, he has even expanded his focus, bringing these programmes to host communities and refugees in Kashmir, building up art and advocacy programmes to address issues such as domestic violence, women’s rights, and social cohesion in these regions.